This Sabal Birmingham is about 25 years old. It was grown from a seedling by Gary Hollar of Gary's Nursery in New Bern, NC. This beauty resides in Gary's back yard and is the source of any Birminghams that we may have to offer. They are available in limited numbers, when available at all. There are very few fruiting (seed producing) specimens out there in the world, but you can rest assure that our Birminghams are the real deal ! COUNTRY of ORIGIN: You tell us and we'll both know. This palm's origin is shrouded in mystery. We do know that the original palm that all seed was collected from was imported from California and thrived in a private garden in Birmingham, Alabama for many years. The palm was moved to the Birmingham Botanical Gardens in 1976 upon the passing of it's caretaker, where it eventually died of transplant shock as well as cold winters, after being moved yet again within the garden. COLD HARDINESS: This is what makes the Sabal Birmingham so special. It may very well prove to be the most hardy trunking palm there is when all is said and done. This mysterious Sabal has survived temperatures well below zero as well as single digits with little or no damage to speak of. Like with all palms, you should protect it for the first few winters in the ground, especially younger plants. That being said, Sabal Birmingham should be a long term survivor in zone 7 all day long. SIZE and CHARACTERISTICS: At first glance, the Birmingham resembles a Sabal palmetto, but upon further inspection, you will notice a sort of "bend" in the middle of the leaf that is distinct to the the Birmingham. 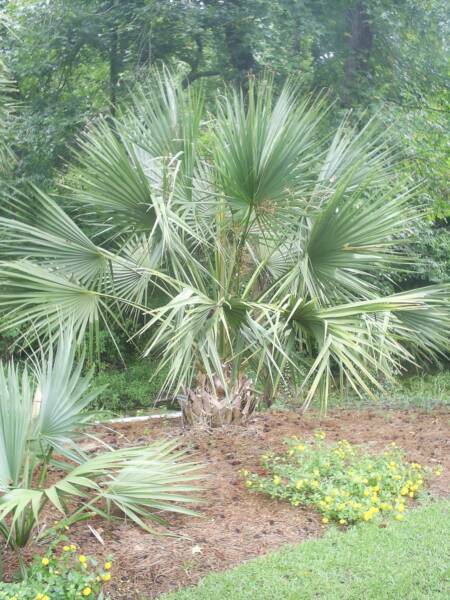 The palm appears to be a touch bluer that it's greener kin, Sabal Palmetto. Although they are a trunking palm, The Birminghams will probably never reach the height of a Sabal palmetto. This makes them perfect for the temperate gardener with less room to play with. They will probably grow close to 20 ft. tall, but only while Rip Van Winkle sleeps. They are a very slow grower, but this undoubtedly attributes to the palm's remarkable cold hardiness.